The atrium sculpture was commissioned by the National Multiple Sclerosis Society, Alabama-Mississippi Chapter, honoring Miller Gorrie. 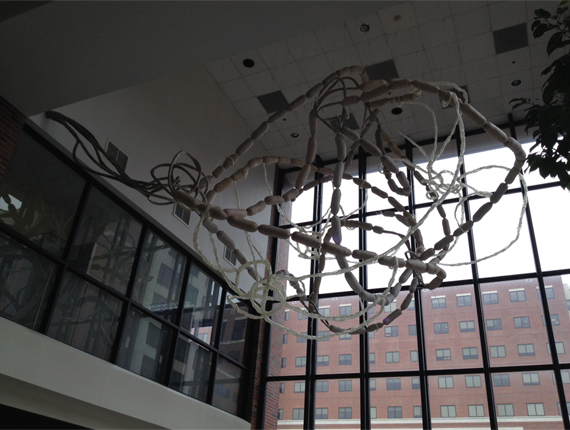 The sculpture is an abstraction of the central nervous system (CNS). It is interpreted and transformed into an art matrix, which becomes an independent force in the three-dimensional atrium. The sculpture is a study of form and space, an exploration and translation of scientific information into art. The content suggests the neuron with its axon, myelin sheaths, cell body, terminals, Nodes of Ranvier and the myelinating glial cells. The forms are created by an array of materials – abaca and kozo paper fiber, acrylic gel medium, programmable light emitting diodes, micro controller, aluminum, stainless and PVC. It becomes a complex dynamic of site and materials. The translucent abaca forms, with the light within, create movement and linear rhythms suggesting a nerve impulse. When the light discontinues it refers to Multiple sclerosis (MS) in which the myelin and nerve are damaged.